The hubster has done it again. I’ve been agonizing over our plan for winter prep. Exterior windbreakers are half of the plan. Hay bales are popular, wrapping hives with roofing paper or cardboard, etc. Lots of ideas out there, but the consensus on wrapping, at least in our area, is that although it keeps the heat in and protects from the wind,wrapping also keeps the moisture in and prevents the hives from “breathing”. Dripping condensation and moisture will kill the bees, especially during freezing temperatures. So good ventilation is imperative. We decided against wrapping and opted for barriers that would envelop three sides, leaving the fronts of the hives open so the girls can come and go as the temperatures fluctuate. 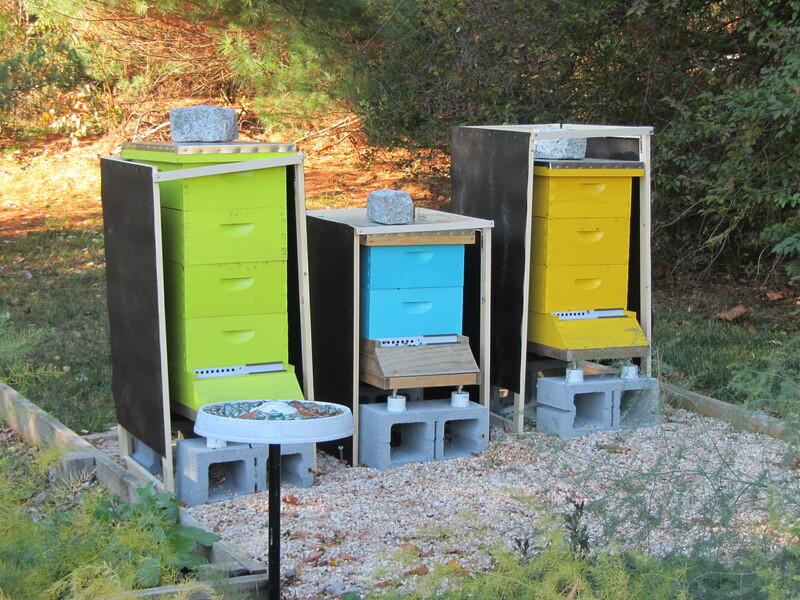 The hubster came up with wooden frames that wrap around the outside of the hives, leaving air space between the frames and the hive boxes for circulation, while protecting the hives from wind. 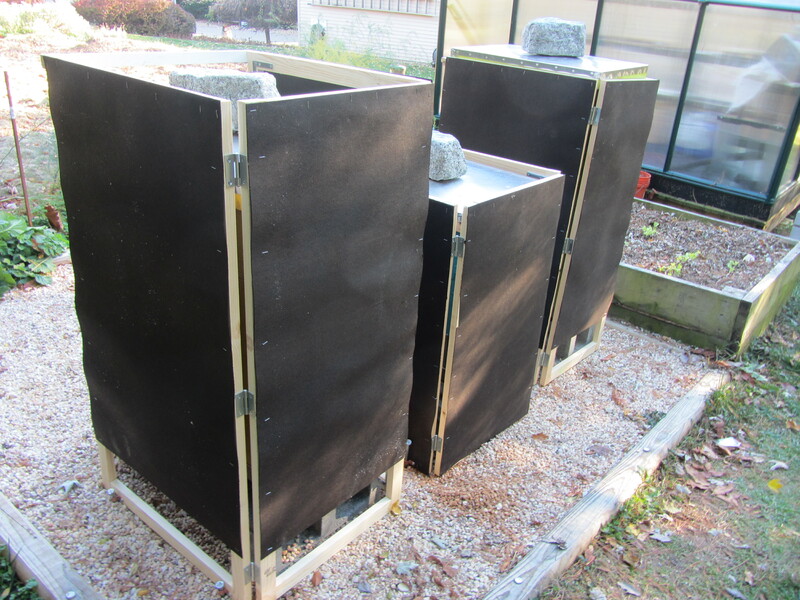 The outside of the frames are lined with black roofing paper to retain heat from the sun. 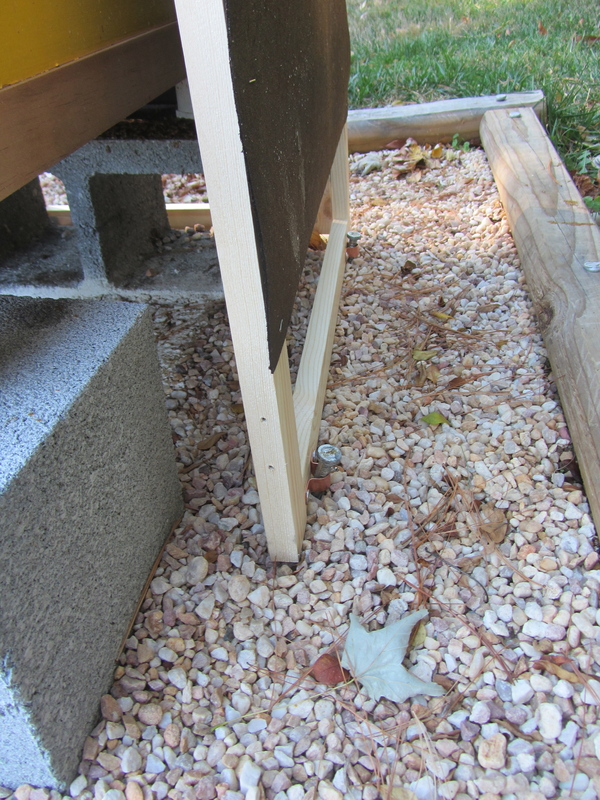 The bottoms are anchored to the ground with large railroad nails, and the tops are open to allow easy access into the hives. The bees don’t mind them one bit (always a plus), access is much easier than if they’d been wrapped, and we can reuse the frames year after year. I confess that having only a few hives does afford the luxury of experimenting with more elaborate solutions like this. And it helps to have a woodworker in the house. As for the inside, they’re ok for now, but after more research, I believe I have a simple and effective solution figured out. 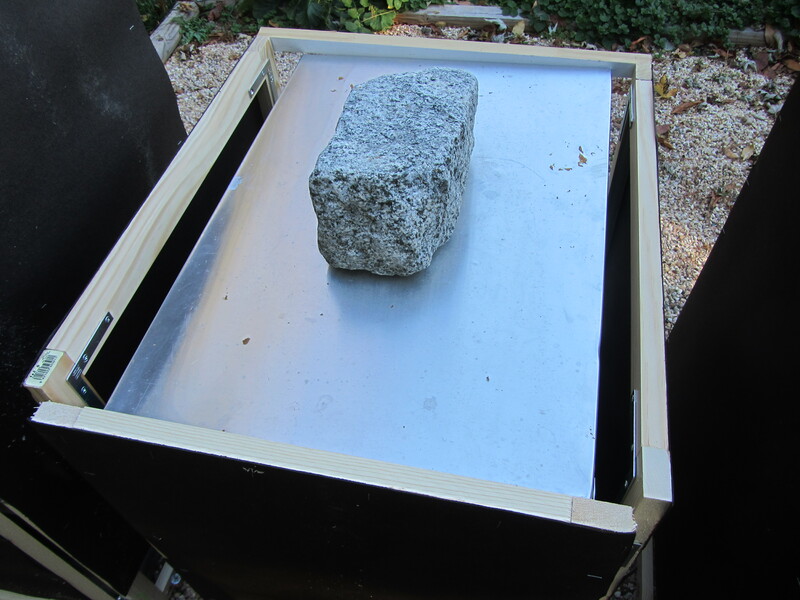 So stay tuned for ideas on how to configure the insides of your hives for winter. Maybe I missed it in a subsequent blog, but how did these 3-sided windbreaker structures work out for you? Exactly what I plan to do only with a top (that can be removed) which overhangs to help keep snow from reaching the landing board. Hi Lorie. I’ve been using the same configuration for 4 winters now. The coroplast sign material makes a great windbreaker. It is lightweight though and can be blown around by the wind, but our hive area is fairly well protected from wind, and we use the metal sign stakes to keep them anchored. Let me know if you have other questions. Hi Lorie. Apologies for the late response. I use the sign boards every year and they work great. I have top entrances on all of my hives, and I also get out and clear landing boards, plus snow insulates, so I don’t worry much about snow getting on the hives or landing boards. We’re also lucky to have a location where they’re already well protected from wind. Starting to winterize this weekend. Thanks for visiting and best of luck to you!